I see a lot of IOS apps using slide-out Side Menu Bar. I’m interested to using it in my apps, but i couldn’t find it in Xcode Object Library, because it is a custom library. 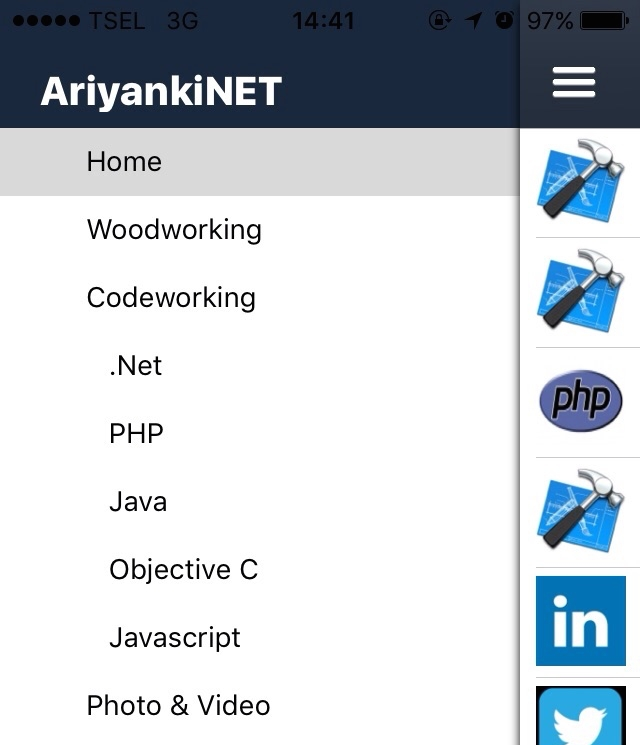 So i google it and found really simple library SWRevealViewController and read this tutorial http://www.appcoda.com/ios-programming-sidebar-navigation-menu how to use that library. Add file SWRevealViewController.h and SWRevealViewController.m to your project. View Controller 1 with class using SWRevealViewController. View Controller 2 for your Menu. View Controller 3 for landing page. To View Controller 2 set identifier with “sw_rear”. To View Controller 3 set identifier with “sw_front”. Create your menu list. In my case, I’m using UITableView and json data. Create segue and choose custom->reveal view controller push controller (SWRevealViewControllerSeguePushController) to View Controller 3, set identifier to whatever you need. If you have another view controller, you just add this segue again. Add Navigation bar and bar button item to show your View Controller 2 (Menu List).